We were among the first people to enter Six Flags Great Adventure this morning, allowing us to walk directly onto the new Dark Knight (#1506). 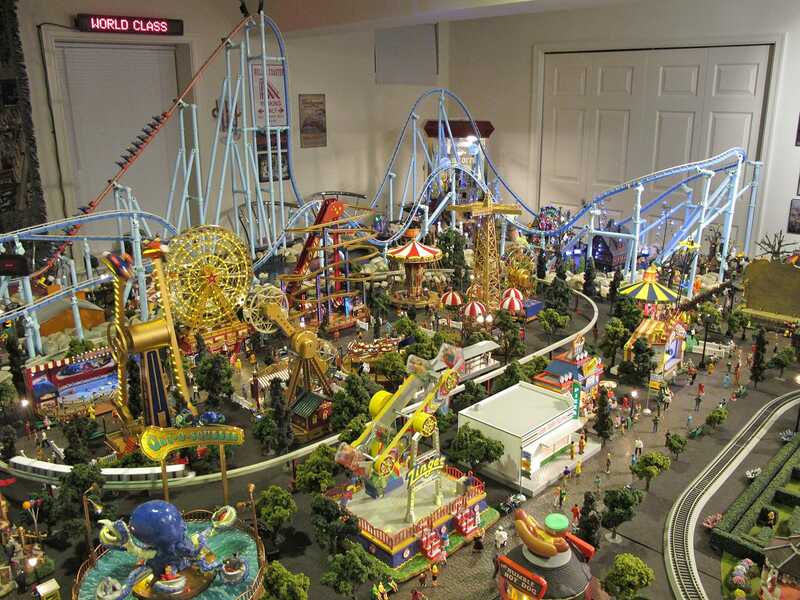 Most readers will already be aware that this ride is simply an enclosed wild mouse ride with a little extra theming, which begins with a rather tedious pre-show that one has to endure before riding. Gotham's district attorney Harvey Dent gives a typically direct speech, rudely interrupted by the Joker et al; most will be able to predict the exact contents without watching. Moving onto the ride itself, the various turns in the mouse layout have been spruced up with colourful but cheap looking theme elements, better than nothing but not up to the rather high standard set by Scooby-Doo. I'd be tempted to award a few points for effort, but that's as far as it goes; when I want to ride a coaster like this I make a visit to my local travelling fair. With the credit out of the way, we wandered onto Nitro. The operator this morning lacked the entertainment factor of the one on duty on my last visit, but he was at least keeping the queue line moving. The ride itself has developed a lot of vibration over the last few years, probably the worst I've noticed on any B&M. It was still a good ride, but time hasn't been kind to it. 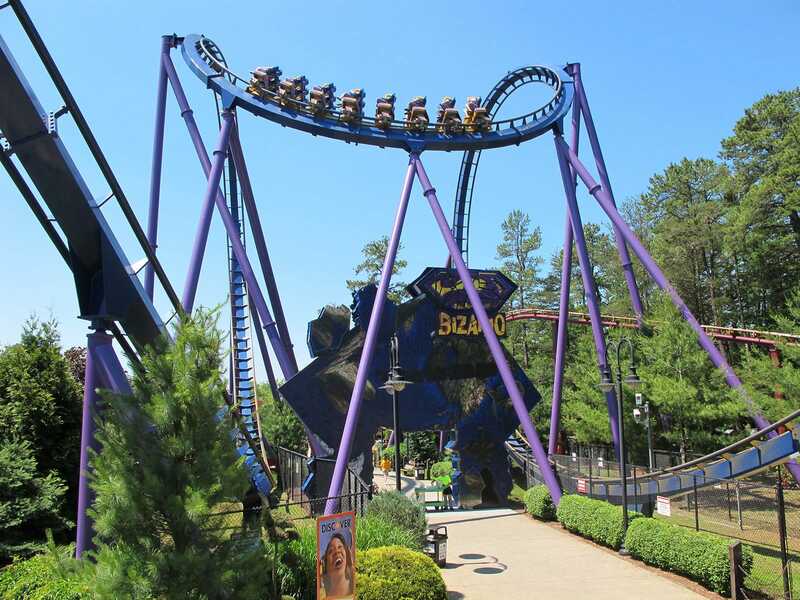 At the other extreme, the recently rethemed Bizarro (ex-Medusa) was running very well even if it was completely impossible to hear the soundtrack. I ended up sitting out an offered second lap due to nausea, something that almost never happens to me on roller coasters. The queue on El Toro was a fairly painful experience today for four reasons, all of which the park could fix if it wanted to; single train operation, ridiculously slow loading, a completely unshaded queue area, and paid line jumpers. With apologies to Six Flags, it is simply inexcusable to allow paid line jumping on a ride which today was handling no more than eight trains per hour. On the plus side the wait did at least prove worthwhile, as the ride was running really well, a particular highlight being insane airtime on every hill. It'd have been nice to try it a second time, but there was absolutely no way we'd have joined that queue a second time. With no wait at all for the nearby Rolling Thunder we decided to risk a lap, and began regretting it immediately by the base of the first drop. Though this coaster has apparently been retracked recently it wasn't apparent in the ride quality, which was a long way from comfortable. By the time the train reached the brake run we'd had enough, and thus we returned to our car and headed into New York. 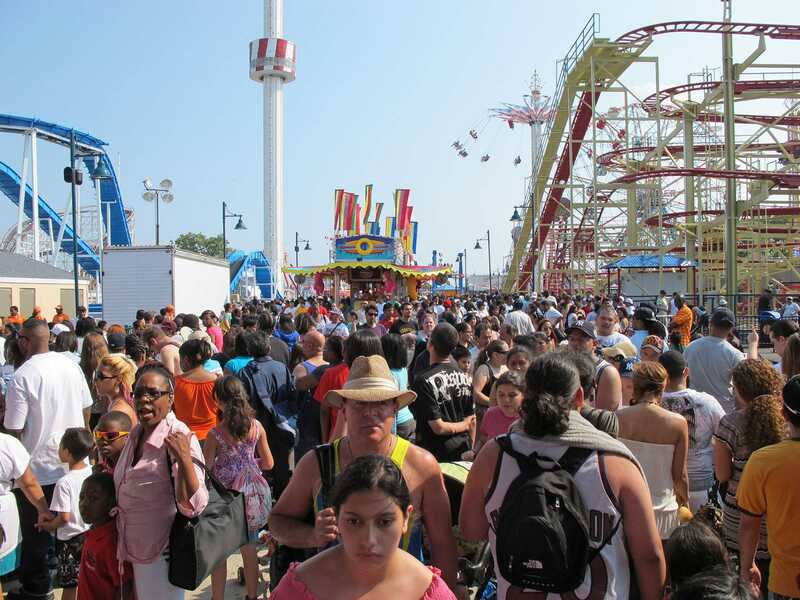 Adventurers Family Entertainment Center is a small park located a little under two miles away from the main area of Coney Island. There were plenty of people around but no queues to speak of, allowing us to grab our credit on the TL*3 Coaster (#1507) and return to the car in less than fifteen minutes. 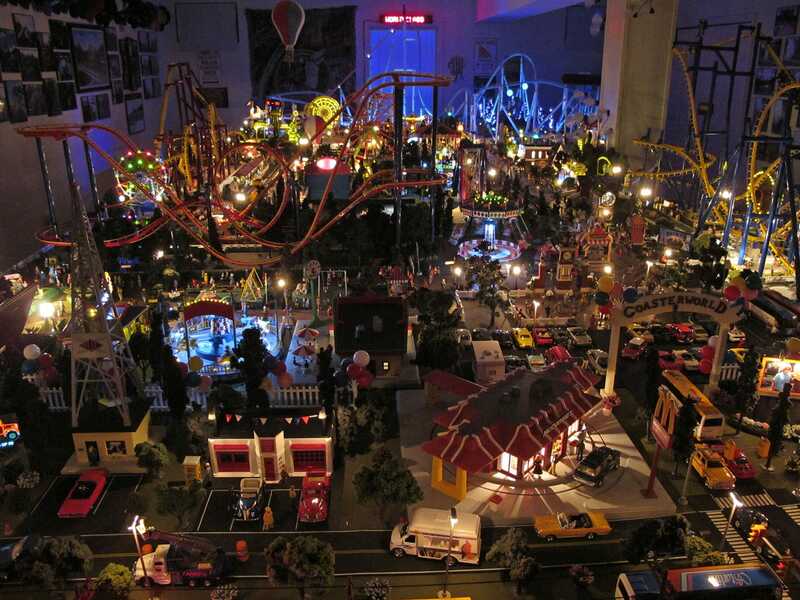 Luna Park is new this year, having been constructed on the site of the former Astroland. Management pulled out all the stops to get the park open in time for Memorial Day weekend, but even with that effort a number of rides were not ready today including one of the two coasters. Worse yet, the incomplete park was absolutely rammed with people, and the ticket sales staff were completely incapable of anything even approaching efficiency. There were maybe twenty people in front of me to purchase ride tickets, and that queue took a full half hour. I'm not at all sure what took so long, as my ticket purchase took thirty seconds, but perhaps it's the fact that I'm not a New Yorker. The next hurdle proved to be the queue for the Tickler (#1508). There were six cars loaded on the ride today, but while we watched there was no time when more than two of them were out on course, indicating a possibly blocking problem. Whatever the case, the capacity reduction resulted in a wait that ran to almost an hour, demonstrating once again (as if it were needed) that counting your coasters is a really bad habit. At any rate, Zamperla's version of the classic Reverchon ride is not an improvement, thanks both to inferior restraints and slightly less accurate track fabrication. Against that, this new coaster has been built next to the Cyclone; people who can cope with that should have no problem with any spinning mouse. 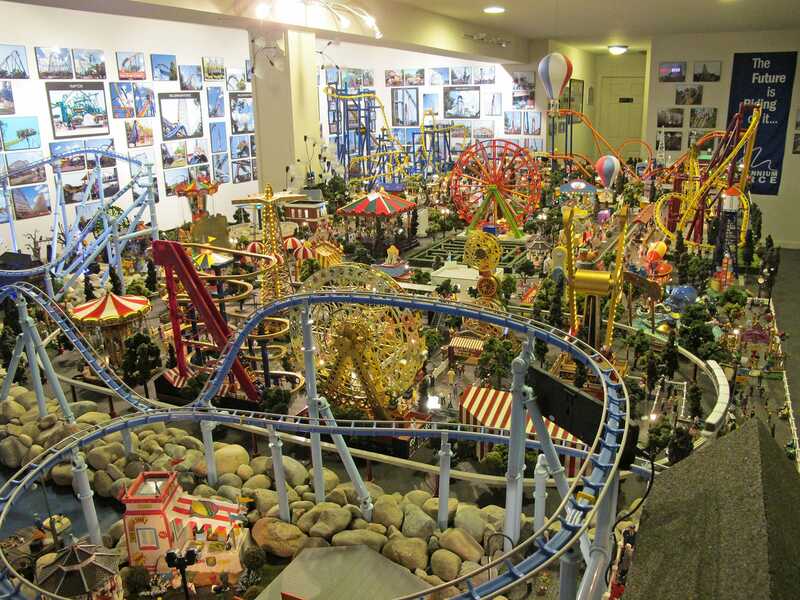 Mike Helt, a member of the American Coaster Enthusiasts, has built a substantial model amusement park in the basement of his home. We were almost two hours late for our planned visit due to delays getting out of New York City, but fortunately we were forgiven; in fact, we were told in no uncertain terms that we were required to attend despite being ridiculously late. In this case I think a few pictures say far more than words can.